If we call them Shasta Daisies you will know that they are long flowering, hardy are indeed a classic white flowering daisy widely grown in many gardens. The botanical name is Leucanthemum x Superbum and with sunny golden yellow centres, these are a real winner for those looking for an easy care plant. A cottage garden favorite the Shasta Dairy with its trademark white flowers with pretty yellow centers that cover the bush for long periods is a tough garden plant. Although they will easily reach 40 – 50 cm in height a few new lower growing cultivars are available that will reach around half that height. Foliage is leathery and the flowers appear on tall stems, white with yellow centres. Chrysanthemum maximum (syn. 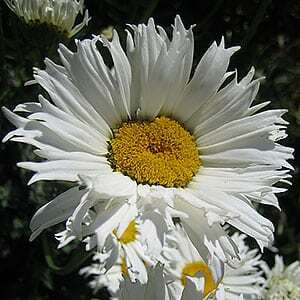 Leucanthemum maximum) is also known as the Shasta daisy, often available as seed. A few named cultivars are appearing on the gardening radar including the excellent ‘Daisy May’ and ‘Little Angel’. Others such as ‘Becky and ‘Highland white’ are a little more difficult to find in Australia. Leucanthemum x Superbum are an excellent plant for dry and difficult positions, they require little care and can easily be pruned to maintain shape and size. Although these are undemanding plants, a little love will improve performance, mulch, manure and water during dry periods will all help. They do tend to ‘self layer’ however they are not invasive .Cultivars such as ‘becky’ and ‘forest white’ are available. Little Angel – Large white flowers with a good yellow centre.